On this tour of Lake Constance with Swifty Scooters, you scoot round the eastern part of the lake using a SwiftyZERO adult kick-scooter, known as the Upper Lake. The most well-known Lake Constance towns are on your path: Konstanz, Meersburg, Friedrichshafen, Lindau, Bregenz and Arbon all bid you welcome. Always close to the lake and with the mountains as your backdrop, this is a new way to tour instead of walking or using a bicycle. To keep the tour as varied as possible, we have included admission to many attractions. As the cycle path between Immenstaad and Friedrichshafen is along the main road, you tackle this part by boat. You will scoot along paved cycle paths, sometimes right next to the bank, sometimes along lakeside roads. This scooter tour around the Upper Lake region of the Bodensee is very well suited to scooting and is a great alternative to cycling or walking longer distances. Take the opportunity to wander through Constance’s old town or visit the aquariums in the Sea Life Centre and go to the Archaeological Museum. From Konstanz you scoot to the nearby Flower Island of Mainau (not included), where you will also find its famous butterfly house. You get from Wallhausen to Überlingen by boat and then scoot to Unteruhldingen. At the Lake Dwelling Museum, Unteruhldingen, you can find out how our ancestors lived here on Lake Constance during the Stone Age. Today, you first scoot to medieval Meersburg and then on to Immenstaad where a boat takes you to Friedrichshafen. Enjoy the fabulous views of the Alps from the boat. Today's destination, Friedrichshafen, has a great Zeppelin Museum we can recommend visiting. It tells you everything there is to know about the history of these air ships. Next, you scoot through extensive orchards, through Langenargen with its pretty Montfort Castle, built in the Moorish style. Shortly after you reach the Bavarian town of Lindau, whose harbour is watched over by a 6-metre high lion. The entire old town lies on an island. You should take your first break in Bregenz, the capital town of the Vorarlberg region of Austria, famous for its annual festival on the world's largest lake-stage. 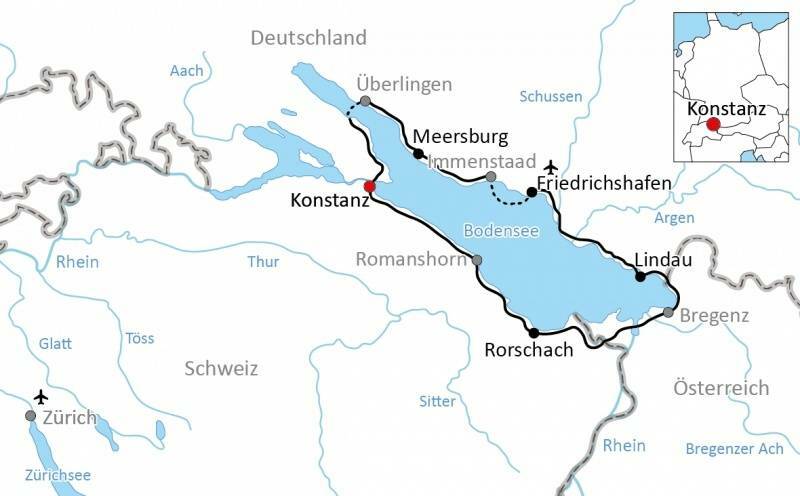 You finally reach Höchst where you soon cross the border again and then, after scooting onwards for a few kilometres, reach Rorschach or Arbon. The last day of your tour takes you through Romanshorn which is home to Switzerland's largest harbour on Lake Constance. Now you continue on along the banks of Lake Constance back to Konstanz. This stretch is flat and easy to scoot along, unless in a stronger westerly wind. You will frequently pass places where you can go swimming and refresh yourself in the lovely cool waters of the lake. Let your tour come to a pleasant end with a wander through the old town or an ice cream down at the harbour. The first three stages are a little bit hilly. Lake Constance cycle path runs along the edge of the lake, mostly flat and without traffic. Sometimes minor roads are used, allowing beautiful scenic views. Appropriate for families and ideal for scooting. If you are concerned about scooting long distances or are unsure if you can comfortably cover the daily distances to each hotel, then you will be pleased to know that the SwiftyZERO has been used to scoot 1000 miles through Japan in recent years and the iconic Land's End to John O'Groats route in the U.K! The Swifty Scooting around Lake Constance active holiday includes the daily transfer of luggage to the next hotel and local support if required. 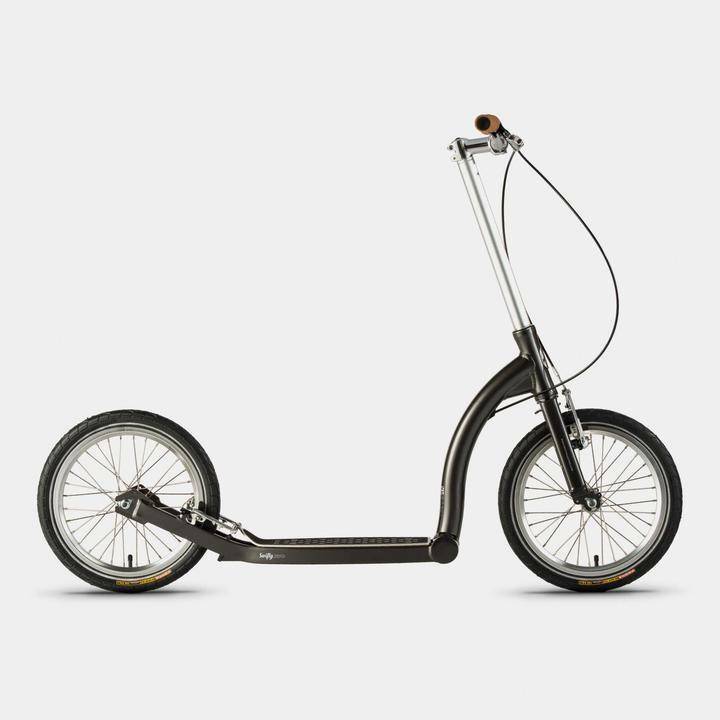 On this holiday, you will be supplied with a SwiftyZERO adult kick-scooter instead of a hybrid bicycle. The SwiftyZERO is a unique way to move. The elegantly formed aluminium frame is lightweight and stiff, transferring energy into speed. The big wheels and high-pressure tyres give a fantastically smooth ride across mixed terrain, and in any weather. You can find out more about Swifty Scooters here. They are based just down the road from Whereabouts Holidays near Manchester city centre. They have also compiled a short film about the great times that can be enjoyed on the different types of scooter that they produce. You can find out more about this scooter holiday by completing a Contact Form or call 0800 755 5385 to speak to one of the team.